Young Neil deGrasse Tyson was starstruck when he first visited the sky theater at the Hayden Planetarium in New York City. He couldn't believe the crowded, glittering night sky at the planetarium was real--until a visit to the country years later revealed the impossible. That discovery was like rocket fuel for Neil's passion about space. His quest for knowledge took him from the roof of his apartment building to a science expedition in northwest Africa, to a summer astronomy camp beneath a desert sky, and finally back home to become the director of the Hayden Planetarium, where it all began. Before long, Neil became America's favorite guide to the cosmos. 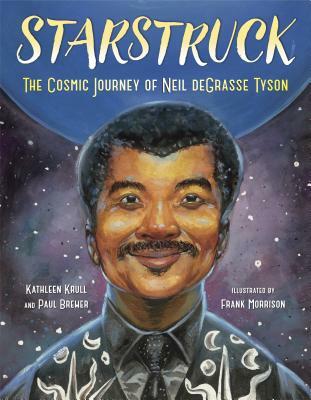 This story of how one boy's quest for knowledge about space leads him to become a star scientist is perfect for young readers who are fascinated by the universe, aspiring scientists, and the dreamer in all of us. It will ignite your own sense of wonder. Kathleen Krull is an award-winning author of a number of highly praised nonfiction books for children, including The Boy Who Invented TV and the Lives Of series. She lives in San Diego. For more, visit her on Facebook or at kathleenkrull.com. Paul Brewer has collaborated with his wife, Kathleen Krull, on several books for children. He lives in San Diego. For more, visit him at paulbrewer.com. Frank Morrison has illustrated more than twenty children's books, including the Coretta Scott King-John Steptoe Award winner Jazzy Miz Mozetta and the Coretta Scott King Illustrator Honor Book Little Melba and Her Big Trombone. He lives in Atlanta.